Sizing may vary depending on state shape. The product will be used for everyday use. It is functional and decorative and a very unique piece! I bought this for my husband as we no longer live in MN. It is such a unique- yet functional piece. I've had several compliments from guests at first glance. It definitely goes with any decor. You can be rustic to modern and the look blends well. The quality is- as always top notch! This gift was great. It was the most different Gift opened on Christmas morning. Big hit. Very high quality construction and perfect for our living room. 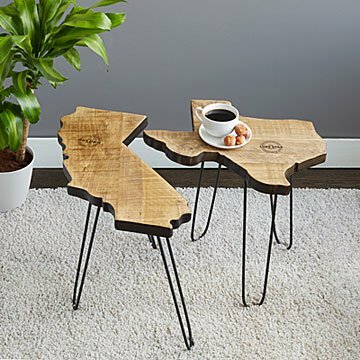 My family is excited about their new beach house at the Jersey shore and this state shaped table will be a perfect furniture accessory. It's clever, the perfect size, and unique without being silly. There was no indication on the product listing that home assembly was going to be required. For the price being charged,I would also have thought that it came assembled. The tool provided to tighten the 9 screws in order to attach the 3 legs to the table base, was difficult to use and actually broke after tightening the 2nd screw. Fortunately I had another tool at home to assist with the remainder of assembly required. Table is a nice addition to our great room.